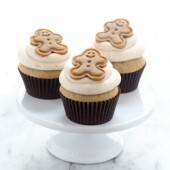 Moist gingerbread cupcakes with brown sugar cinnamon cream cheese frosting. A must make holiday dessert! Preheat oven to 350°F. Line a cupcake pan with 7 paper liners. In a large bowl or stand mixer, cream together butter and brown sugar. Mix in egg and vanilla, beating until smooth. Scrape bowl as needed. Add spices, salt and baking soda, mixing until just dispersed. With mixer on low, alternate additions of flour and yogurt, finishing with 2 tablespoons of hot water. Continue mixing until no streaks remain. Divide batter between prepared paper liners, using a large cookie scoop. Bake for 18-20 minutes or until a toothpick inserted comes out clean. Cool in pan until easy to handle, then transfer to a wire rack to cool completely. In a large bowl or stand mixer, beat together cream cheese and butter until smooth. Mix in vanilla, cinnamon and brown sugar until just combined. Add powdered suger in small batches, mixing well between additions. Transfer frosting to a large piping bag fit with a piping tip. Pipe as desired. Alternately a gallon storage bag may be used with the corner snipped off. Decorate with a small gingerbread cookie. A jumbo round piping tip was used for this recipe.